ATLANTA, GA - In commemoration of Bloody Sunday, on the weekend of March 5 - 6, SCLC/Women's Organizational Movement for Equality Now, Inc. (SCLC/W.O.M.E.N) will take bus loads of people from diverse backgrounds on a two-day tour through the cradle of the Civil Rights Movement. Created in 1987, the annual Evelyn Gibson Lowery Civil Rights Heritage Tour visits several historic sites and meets with people instrumental in the Movement. Students, seniors, elected officials, dignitaries, and celebrities have joined the tour over the years. 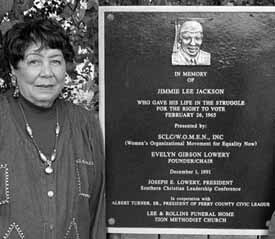 This year founder and chair of SCLC/Women's Organizational Movement for Equality Now, Evelyn Gibson Lowery, will honor the family of slain activist, Jimmie Lee Jackson, whose murderer - an Alabama State Trooper - plead guilty to the 1965 crime in 2010 and was sentenced to six months in jail. The tribute will be held directly in front of the monument SCLC/W.O.M.E.N erected in Jackson's memory at the historic ZionMethodistChurch, once a meeting place for civil rights workers. The tour bus departs from the organization's headquarters on Auburn Avenue in Atlanta and traces the paths of history by visiting historical sites in Birmingham, Marion, Selma, Whitehall, Montgomery, and Tuskegee, Alabama. In addition to meeting people who made history participating in the movement and reliving events that forced dramatic change in America, the group will visit monuments constructed in memory of: Viola Liuzzo, Rev. Hosea Williams, Earl T. Shinhoster, Coretta Scott King, Rev. James Orange, Rev. James Reeb, Albert Turner, Sr., Rosa Parks, and Freedom Wall. Tour participants will also March across the EdmundPettusBridge reenacting the "Bloody Sunday" march. On March 7, 1965, 600 peaceful protestors started a 50-mile march from Selma to Montgomery in response to Jimmy Lee Jackson's murder and to protest for voter's rights. As they crossed the EdmundPettusBridge, the marchers were violently attacked by State Troopers with nightsticks and teargas. The violent incident - known as "Bloody Sunday" - was broadcast on live television and caused outrage around the country. Two days later, Dr. Martin Luther King Jr. led a second march that was turned back by State Troopers. After a federal judicial review, over 25,000 people were allowed to march escorted by the National Guard. Soon afterward, Congress passed the Voting Rights Act of 1965 forcing states to end discriminatory voting practices. The Heritage Tour is open to the public. Travel packages include transportation, lodging, two meals per day, and snacks. SCLC/Women's Organizational Movement for Equality Now is an independent 501c(3) nonprofit organization founded in 1979 by Evelyn Gibson Lowery to champion the rights of women, children, families, and responding to the problems of the disenfranchised regardless of ethnicity, gender, age, or religion. Programs include: youth mentoring, domestic violence education, HIV/AIDS education, and computer training. Their Heritage Pride program hosts the annual Evelyn Gibson Lowery Civil Rights Heritage Tour through the cradle of the civil rights movement and has erected 13 monuments honoring civil rights icons.